"Her confidence soars as she takes the stage! These are the memories that last a lifetime..."
Your child will step into a creative new world each class as she explores her world through the stage! 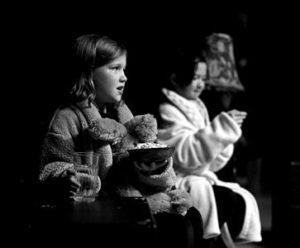 At SAA our classroom is equipped with costumes, props and theatrical lighting which create an awareness that dramatic play is more than playing pretend – it is creating art! For the school-age artists the day is full of math and science, raising hands and sitting in rows. With our dynamic curriculum taught by accomplished instructors your child will have a respite each week to escape the logical and expand areas of the brain that foster creativity and intuition. Ultimately, this is our covert plan to improve our world for the future. Shhhh! Don’t tell them, they’re just having fun! From day one, you can be assured that your young artist’s confidence will soar as he is embraced by a culture that builds community. Drama students learn that they share the stage, that each voice brings value and each person is to be respected. One stage at a time, we are committed to helping your child build the kind of character that lasts a lifetime. The thrill of performing on the big stage! The audience erupts in applause and squeals of delight escape the lips of the close-knit cast. “Let’s do it again!”. These are some of the memories that each young artist cherishes. We love being a part of these precious memories and look forward to creating those special moments with your young artist! For our Baroque level artist, Drama class becomes a space for grandiose exploration, engaging the child’s love of learning by discovering the art of the stage! His creative energetic spirit feels right at home! “We are so happy to have found SAA. Miss Patty and her drama magic have coaxed my very shy child out of her shell.